5 Beds 3 Baths 2,909 Sq. ft. This is THE ONE! 5 bedroom & 3 bathroom beauty situated on wooded lot on cul de sac street!! Great floorplan - 3 br & master upstairs along w/huge laundry room; bonus/flex room downstairs w/closet & access to full bath. Lots of wood & tile floors; kitchen is fully equipped w/stainless steel appliances, granite counters, food prep island, walk-in pantry, bar top & open to breakfast nook & gathering room. Separate formal dining room w/plenty of room for table, chairs & hutch. 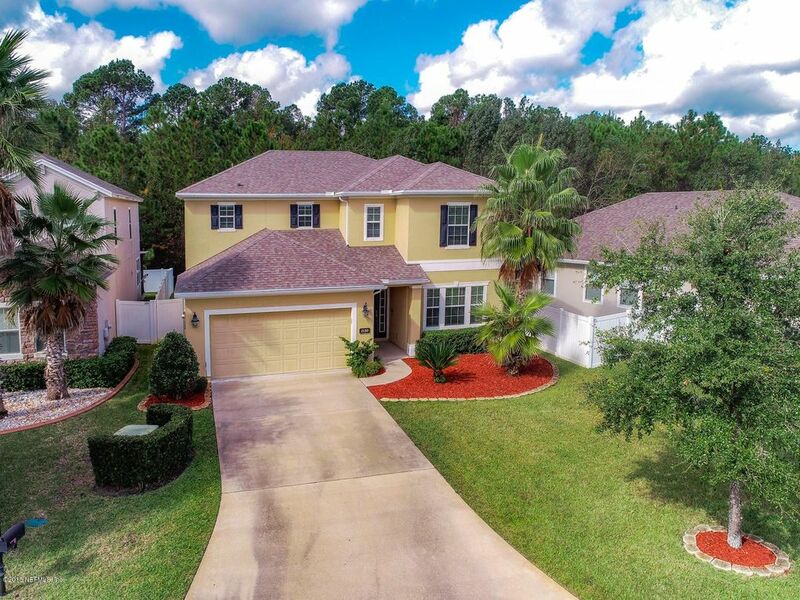 Master retreat overlooks pretty treed lot & offers en suite bath w/double walk-in closets, raised vanities w/his & her sinks, garden tub & walk-in shower. There is no shortage of closet space in this house either! Great floorplan if you need a bedroom on first floor for in-laws or overnight guests! See supplement. Transferable termite bond, sprinkler system, new garage opener, HVAC-2017, screened lanai, pavered area w/cover - perfect for grilling outside, corner lot on short cul de sac street. Community offers pool w/kids splash park, basketball court, tennis, fitness center and playground! Centrally located to dining, shopping, beaches, downtown, TIAA Field, St Johns Town Center and public transportation! Directions: From Atlantic Blvd, south on Kernan Blvd, right on Wynnfield Lakes Drive, left on Wynnfield Lakes Cir, left on Arrowrock Ct, house will be first one on right.